The age of social media presents countless networking opportunities; a chance to connect with individuals we previously wouldn’t have had the opportunity to meet. While traditional networking still has its place in the business world (sometimes nothing beats face-to-face contact! ), you’re missing out if you’re not talking to target stakeholders and fellow business peers online as well. A great way to naturally connect with people who might be of value to your business, is by taking part in themed Twitter chats. If you’re new to the concept, these chats are usually led by experts and act as information sharing forums. Everyone involved uses a set hashtag to enable users to follow the chat with ease, and it usually involves the asking and answering of a series of questions or a group discussion about topics/issues over an hour. There are tons of examples of Twitter chats – view an extensive list here. Many of these are aimed at business people, from #smallbizchat with Melinda Emerson to Forbes magazine’s regular #AskForbes discussions. Twitter chats are a great way to show off your expertise, as well as learn from others! Just be sure to not share overtly promotional/sales messages during the chat – that could annoy fellow tweeters. Once you’re a regular, you might even want to look into opportunities to guest host chats. For example, #smallbizchat features guests, or you or your company could lead one if you have a large enough following. Whether you’re a Twitter chat regular or new to the concept, there’s an upcoming Twitter chat you won’t want to miss! 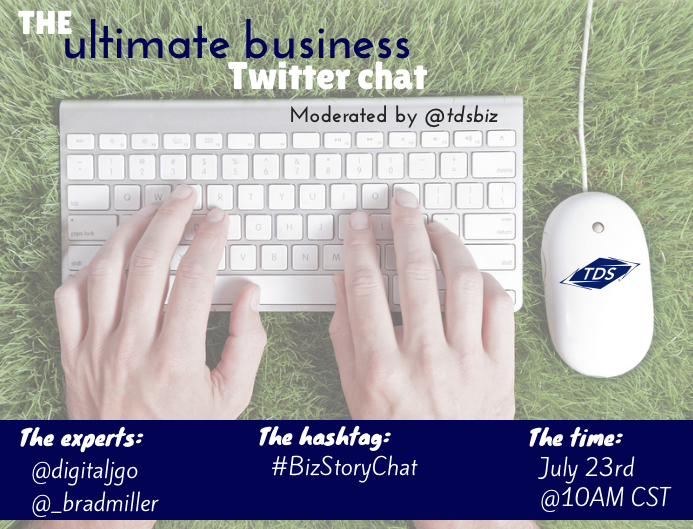 On July 23rd at 10am CST, two super-talented content marketing pros – TDS bloggers, Brad Miller and John Gregory Olson – will lead a discussion about important content marketing and #business storytelling strategies (follow and use the Hashtag #BizStoryChat). Come join in the fun!